• For quantitative determination of glucose and evaluation of drug effects on glucose metabolism. • Glucose (C6H12O6) is a key diagnostic parameter for many metabolic disorders. Increased glucose levels have been associated with diabetes mellitus, hyperactivity of thyroid, pituitary and adrenal glands. Decreased levels are found in insulin secreting tumors, myxedema, hypopituitarism and hypoadrenalism. Simple, direct and high-throughput assays for measuring glucose concentrations find wide applications in research and drug discovery. BioAssay Systems glucose assay kit uses a single Working Reagent that combines the glucose oxidase reaction and color reaction in one step. The color intensity of the reaction product at 570nm or fluorescence intensity at λex/em = 530/585nm is directly proportional to glucose concentration in the sample. 1. What are the differences between the three EnzyChrom Glucose assay kits? 2. Which of the three EnzyChrom Glucose assay kits can be used with urine, saliva, or serum samples? 3. How specific is this assay (EBGL)? Glucose oxidase is fairly specific for D-glucose and does not react with fructose, galactose, or xylose. It does react with the following sugars: 2-deoxy-D-glucose (11% relative activity compared to D-glucose), 4-o-methyl-D-glucose (7%) and mannose (3%). 4. Can this kit be used to measure glucose concentrations in cells? 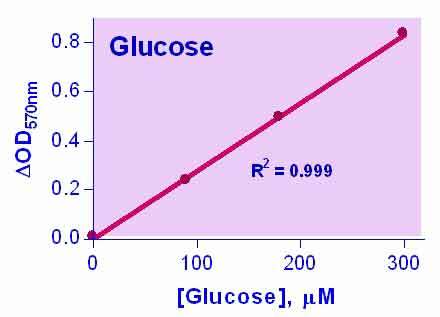 Glucose is converted into glucose-6-phosphate within the cell, which may not react with our assay. We have not tested it, but if the concentration of free glucose in the cell is within the detection range (1 to 30 μM for fluorimetric assays) of the assay it could still work.